Chancellor Osborne to sell RBS shares at a loss. What's he up to?! Tory MP Andrew Tyrie, the chairman of the Treasury select committee, cast doubt on chancellor George Osborne’s claims taxpayers stand to make a £14bn profit from the 2008 banking bailout. Osborne unveiled plans on Wednesday to start selling a 79 per cent stake in Royal Bank of Scotland (RBS) – but at a loss to taxpayers who bailed out the bank. Osborne explained, citing a report published by advisory firm Rothschild, that a £7.2bn loss on the sale would be cushioned by a gain made on the sale of other state-owned assets like Lloyds. Overall, Rothschild estimated a £14.3bn surplus for the Treasury from its interventions in the banking sector. 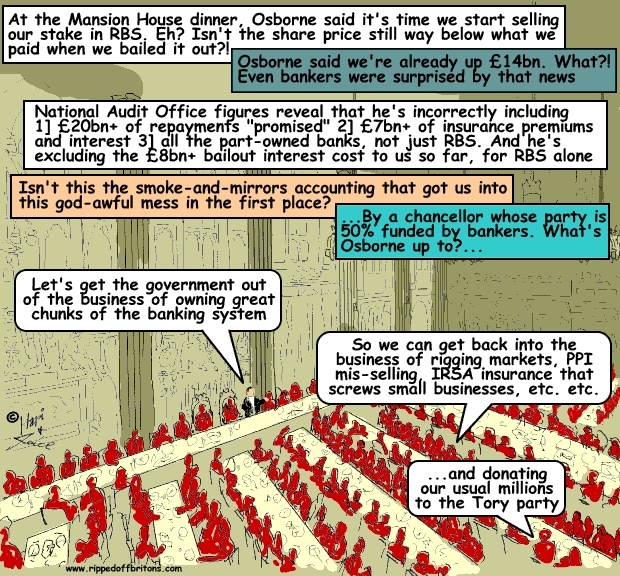 But Tyrie said Osborne’s calculation “...would benefit from a great deal of qualification... It excludes the cost of funding the bailouts (£17bn)....And it treats fees paid in exchange for a service as if they were income, or recoveries.” Shares in RBS were at 361.5p yesterday. after the sell-off plans were unveiled. The government would need to sell shares at 407p to break even on its £45bn 2008 recapitalisation of the bank. The first sale of shares is set to come in the next 12 months but could be as soon as September.